Marta Vega, a native of Mayaguez, Puerto Rico, has long called Seattle home. Here, she’s worked with El Centro de la Raza and for POCAAN (People of Color Against AIDS Network), and for nearly 30 years has lent her expertise at the stove at community events. Then, early this month, “abuela” Marta did what she says she’s been wanting to do “forever.” She opened El Pilon, adding her native cuisine to the wide world of flavors that make her South Seattle neighborhood such a delicious melting-pot. Today, with the help of her son Luis Vega — among other extended-family members — the beloved matriarch is running a 35-seat cafe at 5303 Rainier Avenue South, offering homestyle Puerto Rican comfort-food at lunch and dinner. Marta Vega, relaxing at the grand opening celebration of El Pilon. 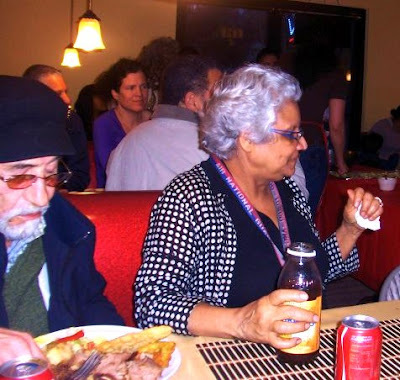 Seated next to her — with fork in hand — is Roberto Maestas, co-founder and executive director of El Centro de la Raza. 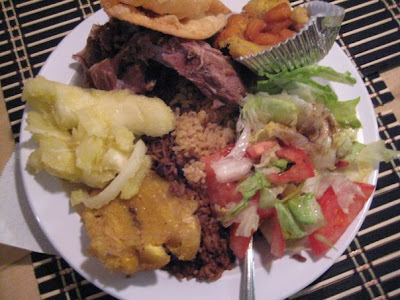 At El Pilon, you might sit down to a plate of mofongo (plantains mashed with a handmade wooden pilon, or pestle), arroz con gandules y chulecas fritas (rice with pigeon peas and fried pork chops) or arroz con habichuelas y pollo en fricase (chicken with rice and beans). And though they don’t have a beer and wine license — yet — you can instead sip juice made from guanabana while nibbling bacalitos (salt cod fritters). Comida Puertorriquena, at El Pilon . Open two weeks, El Pilon is still getting its sea legs, and though I haven’t been there, I’m putting it high on my list of new places to try. From the sound of things, it will bring me back. Way back. To when I lived in Rincon, Puerto Rico. Long before Rincon became a tourist mecca, I was there waiting on (and rooting for) the local baseball team — Marta’s own Mayaguez Indios, diving for spiny lobster, tasting my first avocado, papaya and fresh coconut and learning to love empanadillas (those meat turnovers are on the menu at El Pilon). 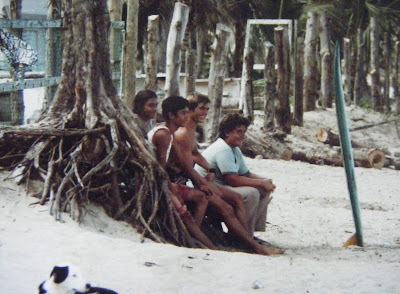 The local guys, checking out the surf in Rincon in 1977. Hey Luis! Recognize anybody? 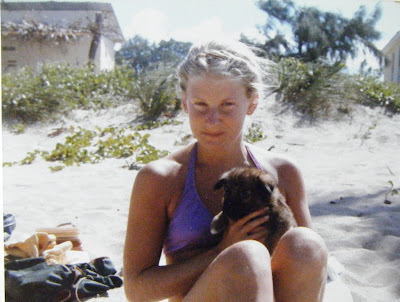 Me, on the beach in Rincon, back before I ate too many empanadillas.